For proper use of Pensar Medical products, please refer to our Owner’s Manual, as a complete reference source for clinicians, caregivers, and device labeling. How many different NPWT products does your company currently produce? At the present time, Pensar Medical manufactures and sells one negative pressure therapy system, the WoundPro NPWT System. We also manufacture and sell all the related products necessary for negative pressure wound therapy, namely dressing kits and collection canisters. In addition we offer bridge kit systems and a patent pending Y-Connector to treat two wounds with one control unit. What is your most popular NPWT product? The WoundPro Negative Pressure Wound Therapy System is our most popular unit at the present time. What is the suction pressure of your machine or the range of pressure that the machine achieves? The WoundPro is one of the most powerful units in the market today. The WoundPro offers 8 lpm of suction flow. The pressure settings range from 0mmHg to -200mmHg depending upon the physician’s discretion. No. However the unit does remember the last pressure setting used by the unit prior to it being powered down. At Pensar Medical we know that no one pressure or therapy mode is right for every patient, allowing the physician or caregiver to choose the best therapy possible for each individual patient. The Control Unit will not influence that decision with automatic “defaults” when the unit is powered on. Because the WoundPro will remember that last setting before powering off as a convenience to the user, you do not have to reprogram the unit for the same patient every time the unit is turned off for any reason (e.g. dressing or canister changes).. Absolutely. The WoundPro is designed to allow the user to change therapy modes, times and pressures, all at the touch of a button on the control panel. Is there an intermittent feature? Yes. The WoundPro was one of the first units to provide all three negative pressure therapies. It not only provides continuous therapy but also both intermittent and variable intermittent therapy. Is there a cut-off which stops suction if the canister is full? Yes. The WoundPro provides not only an alarm when a canister is close to capacity and will need to be replaced soon, but also shuts down the pump when the canister becomes full. Is there a one-way valve to prevent fluid from coming back through the tubing towards the patient? A one-way valve is unnecessary because once the fluid has reached the collection canister, all exudate is then trapped in the canister and cannot flow back to the patient. 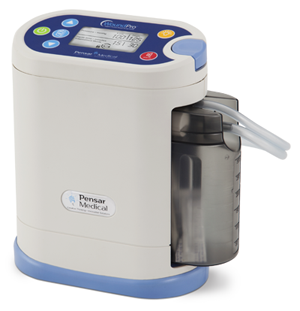 It is virtually impossible for fluid to flow back towards the patient if the unit is set in either the continuous or variable intermittent modes as negative pressure is always being applied at some level. Should a line blockage situation occur, an alarm will sound, alerting the user of this condition, further preventing any fluid going back toward the patient. When fully charged the WoundPro is designed to last the industry standard of 24 hours (at the very least), assuming there is not a gross leak in the dressing application. While the user’s assurance that the charge will last 24 hours as a bare minimum, new batteries on the WoundPro have lasted as long as 72 hours in testing in our lab. How much does the machine weigh? The WoundPro Control Unit weighs 3.8 lbs when the canister is empty. Since the introduction of the WoundPro a couple of years ago, it’s clear that the market is asking for smaller, more portable units. However most smaller units come with smaller pumps (a reduction in power) and smaller batteries (shorter battery life). What is the interface with the wound? Pensar Medical offers our ProFoam® hydrophobic (reticulated) foam dressings in a variety of sizes to accommodate wounds of any size. How often do you recommend changing the dressing? As a general rule, dressings should be changed approximately every 48 to 72 hours, but no less than 3 times per week. This guideline normally applies to non-infected wounds. Monitoring of the wound must be performed on a regular basis. Is non-infected the industry term? Infected wounds must be monitored more often. The dressing change intervals should be based upon the wound’s progress and condition, which can result in more frequent dressing changes. The frequency of the dressing changes can be adjusted by the clinician as appropriate. Can you “Y” wounds together and if so how many? How do you handle undermining? How often do you handle fistulas? Negative Pressure Therapy is contraindicated for use with non-enteric and unexplored fistulas. If considering the use of Negative Pressure Therapy involving enteric fistula, it is recommended to seek support from an expert clinician. Negative Pressure Therapy is not recommended or designed for fistula effluent management or containment, but as an aid to wound healing in and around the fistula. How do you handle exposed tendon or bone? Tendons, ligaments and nerves should be protected to avoid direct contact with Negative Pressure Dressings, and can be covered with natural tissue or meshed non-adherent porous material or bioengineered tissue to help minimize risk of desiccation or injury. Bone may be protected with a single layer of a non-adherent interface. Do you have any special recommendations for high bio-burden or infection? Negative Pressure Therapy is contraindicated for untreated osteomyelitis. If a clinician decides to use Negative Pressure Therapy for other infected wounds, then they must be monitored often and very closely, and dressings may need to be changed more often than 48 to 72 hours in order to assess the wound and patient condition. The dressing change intervals should be based on a continuing evaluation of wound condition and the patient’s clinical presentation, rather than a fixed schedule. The Pensar WoundPro Negative Pressure System can be either purchased or rented and is typically billed to the patient’s insurance depending on eligibility and coverage through our nationwide distributor network. Dressings and dressing kits are available for purchase and supplies can be replenished as needed, based on clinical evaluation by healthcare professionals.